Arrived in February in grainpro. 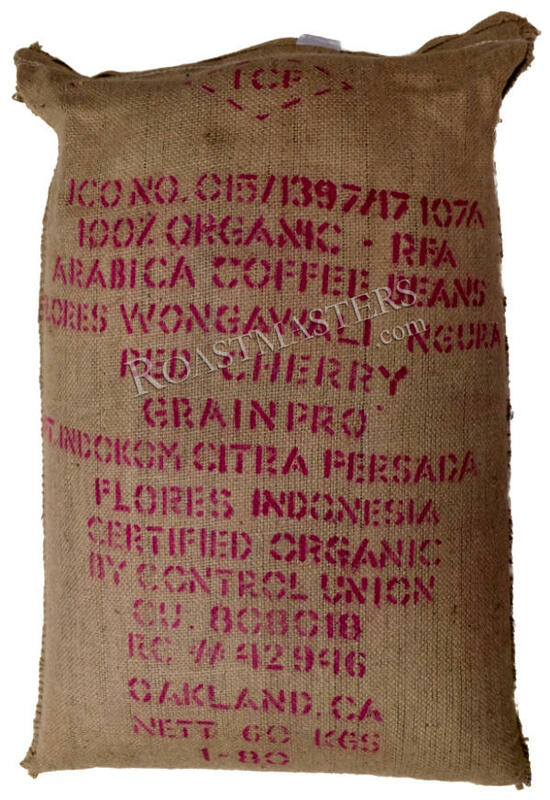 Flores Wongawali Ngura Red Cherry Organic is sourced from 80 family owned farms located on the eastern slopes of Wolo Ngadha and Wolo Atagae in the Ngada regency of Flores, Eastern Nusa Tenggara, Indonesia. The Wongawali farmer group has pooled resources to improve processing coffee using wet-hulling techniques (called Ngura in the Ngadha language), a uniquely Indonesian processing method in which the coffee parchment is removed before the final drying is completed, giving the coffee its hallmark Indonesian flavor. Coffee is dried on raised beds at this location. The Red Cherry Project coffees provide dividends to farmers who deliver ripe coffee to collection centers. This coffee is also Rainforest Alliance certified for its stewartship of land resources and sustainability. Cup characteristics: Coffee from Flores is known for sweet chocolate, floral and woody notes. Very earthy and smooth, even more so than Sumatra. Background smokiness that makes for a distinctive cup. Mouth coating body and chocolaty texture. Roasting Notes: We roasted the coffee rather lightly and it produced the cup profile shown above. We would suggest using slightly less coffee than the charge weight of your roaster because this Flores may take a bit longer to roast; thus on programmed roasters you may run out of time. For example, if the program calls for a quarter pound (113 grams) try using 100 grams of beans. This coffee should also produce a very distinctive and interesting dark roast and could be a good candidate for a single origin espresso.